Anyway, this post is about movie taglines – specifically, the words that constitute them. I’ve put up word clouds for each decade, and the code to generate them on imgur and github. So that’s that for frequent words. But I’m also after words that are frequent exclusively in high (or low) rated movies. Or to look at it another way, words that, in retrospect, are indicative of the movie’s success. NOTE: Some math to follow. If you’re uncomfortable with arithmetic and/or statistics, skip a couple of paragraphs. 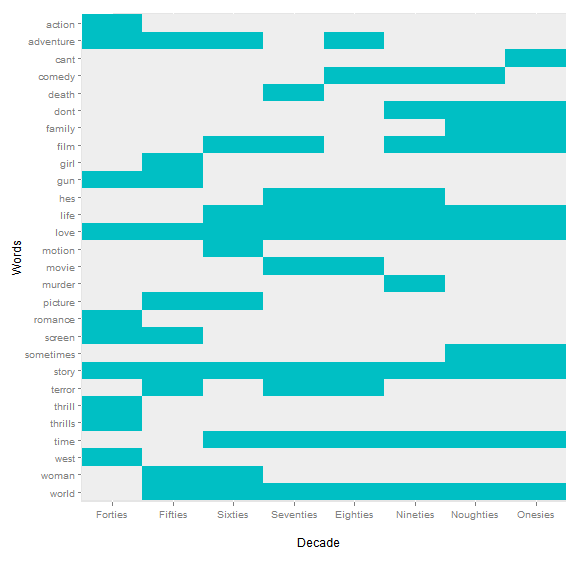 Adding such words will not automatically make your movie successful – this is offered a post-event descriptive analysis, not a predictive one. I’m not implying any causality here. 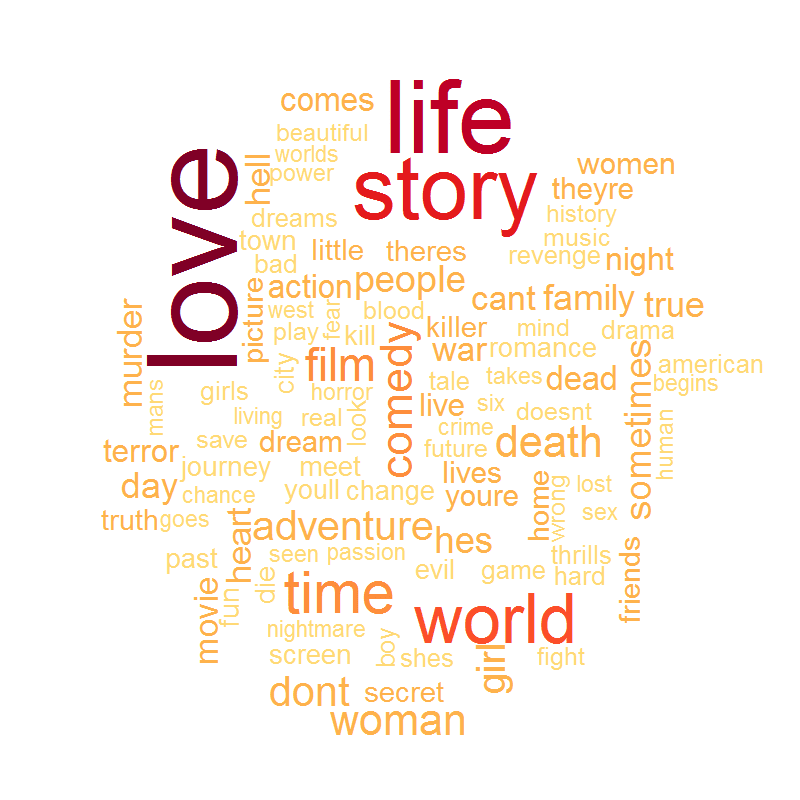 This divergence is just a magnitude – so I had to separate the most related ‘good movie’ keywords list from the ‘bad movie’ keywords list. If these lists make you have second thoughts about making Warrior Zombies from Outer Space II: Mayhem Unleashed, don’t be disheartened – because like I said earlier, there is certainly a correlation, but it’s not necessarily a causal relationship5. And hey, I know a bunch of people who would watch the hell out of that movie. 2 The punctuation has been removed from the data to make the analysis easier. So if you see “cant”, that’s probably “can’t”, and so on. 4 IMDb ratings are arguably, not the best indicators of movie success, but that’s certainly one way of estimating, and there is probably going to a future post analyzing how reliable a measure this. 5 EDIT: Revisiting this, the final two lists of words don’t seem particularly robust. To leave a comment for the author, please follow the link and comment on their blog: Hot Damn, Data!.